A collaboration of more than 45 thinkers who form the "canon" of contemporary political thought--from John Dewey and Walter Benjamin to Malcolm X and Judith Butler. 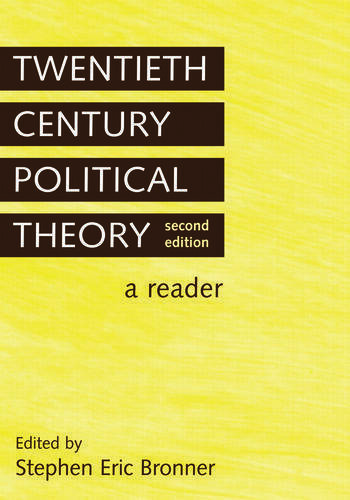 Twentieth Century Political Theory fuses the needs of the more traditional course with the rapidly changing and extremely influential new approaches to the field. Designed for undergraduate and graduate students, this volume includes essays by major figures like Hannah Arendt, Simone de Beauvoir, Sir Isaiah Berlin, John Dewey, W.E.B. Dubois, Frantz Fanon, Michel Foucault, Antonio Gramsci, V.I. Lenin, Jurgen Habermas, Adolph Hitler and others. Its range and innovative character will assuredly make this anthology the major primary work in political theory for many years to come. Stephen Bronner is Professor of Political Science at Rutgers University. He serves on the editorial boards of the journals New Politics and New Political Science. He is the author or editor of sixteen books, including Moments of Decision (Routledge, 1992), which won APSA's Michael Harrington Book Award.